Benchmark tests of a reported HTC-built Nexus 9 tablet indicate that Nvidia’s 64-bit chip will power the slate. A photo of the test from TKTechNews, which has a reasonably good track record of accurate device leaks, clearly shows the dual-core “Denver” chip in the benchmark results. With Google touting that Android L will be fully 64-bit capable when it launches later this year, this means the tablet could be the first Nexus device with a 64-bit chip. The Snapdragon 805 processor is pretty cutting-edge at the moment, but it isn’t 64-bit compatible. The test phone was shown to be running Android L, which Google said in June would be fully 64-bit, complete with the new ART run-time. Assuming this device is the Nexus 6 — a possibility since Google does rotate through hardware partners for the Nexus line — why would it showcase Android L on a phone with a 32-bit processor? I still don’t think this scenario makes sense, but Qualcomm’s own 64-bit chip strategy may be affecting Google’s decision here. The chip company decided to bring 64-bit compatibility to its mid-range processors before adding it to the high-powered silicon that a Nexus would likely use. As a result, the Snapdragon 808 and 810 chips — both of which support 64-bit computing — aren’t expected until late this year, with devices using them in early 2015. If Google is debuting a 64-bit software platform this year, waiting on Qualcomm isn’t a good option. That leads me to think that if [company]Nvidia[/company]’s Denver chip is ready to go soon, it’s a Nexus 9 tablet and not a Nexus phone that will be used to highlight [company]Google[/company] Android L.
It’s also worth mentioning an Nvidia press release from earlier this month: The company stated in no uncertain terms that its Tegra K1 Denver chip will be the first 64-bit ARM processor for Android. If it were the Nexus 9 that the CPU-Z app happens to be running on, the Back, Home, and Recent Apps buttons would be LMP-style, not KitKat-style… So, nope, not convinced. Cannot believe that the next Nexus phone will not be 64-bit. It is their internal developer device, aside from being available to the public. Android L is pure 64-bit and developers need a 64-bit platform to work with on mobile. It simply does not make sense. Does the K1 have an integrated baseband option? That might be the sticking point, unless they combine another baseband with it. It’s still confusing to me. I don’t understand why Nvidia launched the 32 bit K1 seemingly just a heartbeat before launching the 64 bit. The market is going to want the new shiny 64 bit, which puts a bit of a hurt on their own Shield tablet and the new Acer Chromebook I think, as both of these sport the 32 bit. It seems like they must differentiate in one of two ways – price or features/performance. That means either the 32 bit has to be better at something than the 64 bit – which seems like it also has long term negative impact on their product. Or the 64 bit devices must be sold for a higher price. The Sheild tablet is already pushing the price at $300 for an 8″ tablet and the K1 Chromebooks are also on the high side of the Chromebook pricing scale. It seems like at best they can hope for a lot of market confusion, which will greatly irritiate customers. I’ve already seen people commenting (people who should know better – Leo Laporte) that they ordered the Acer Chromebook 13 with Nvidia K1 thinking it was 64 bit. At worst they will drive people away from two brand new products in the Sheild tablet and these first K1 Chromebooks as potential buyers wait to see if a 64 bit version comes in. I might be in that camp myself. End of the day I suppose it’s a hard call to throw engineering and planning out the window. Perhaps there were delays to the 32 bit K1 which pushed the launch back. 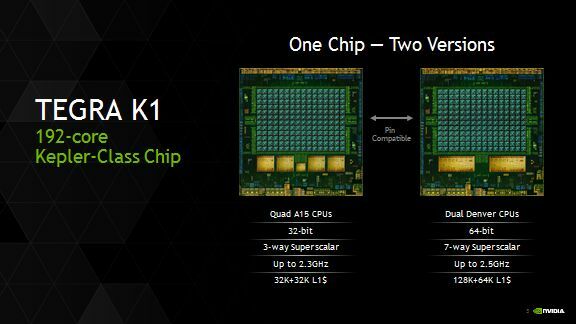 But if all the specultion is correct and we see the Denver K1 launch in just a matter of a few weeks then that is going to be a mess for Nvidia one way or another. I beleive these K1 processors are supposed to be pin compatible for easy integration going forward. Of course that doesn’t mean thermal requirements are necessarily the same so it might not be as easy as all that. But off hand one has to wonder why they didn’t just delay the Chromebook and Shield tablet slightly and have a massive push on 64 bit devices across the board. Can’t wait to see it. Wish I could buy one today!! !